Let’s recall that to be selected for this list of the greatest revenue stamps, the stamp needs to meet one or more of the following criteria: visually stunning; historically significant; interesting philatelic history; recognizable to those outside the hobby. For the sake of interest each article in this series has tried to pick items that are diverse — some old classics, some modern items, and this month we will even venture beyond the confines of the Scott U.S. Specialized. The stamps featured this month are two private die proprietary stamps and two obscure tax paid stamps. This may turn out to be a mixed bag, an observation that will only become evident at the conclusion of this article. The first is the Thomas E. Wilson, M. D. private die medicine stamp, RS271. The uniqueness of the Wilson stamp is several fold, there being but a single surviving example. But there are other private die medicine stamps that survive in single examples, but in each case there are other examples on a different paper or in a different color. So the Wilson stamp is the only example of a face different private die proprietary stamp. We are grateful to the late Henry W. Holcombe for collecting the facts about the private die proprietary stamps. His efforts to dig out the background and human side of the firms who used the private die stamps are well known by veteran collectors and have inspired another two generations of collectors to continue the research into the stories behind the stamps. For over 20 years Holcombe produced 140 articles on the medicine companies and they were published in 6 different philatelic journals. Holcombe’s work was collected in Patent Medicine Tax Stamps, a Quarterman Publications volume that is scarce. If you collect these stamps, this book is a must for your library. Although there are a few cases where Holcombe’s research was not perfect, his work continues to be the starting point for anyone who wishes to understand the background of most of the medicine companies who used these stamps. For the background on the Wilson stamp we are indebted to Holcombe. Wilson’s name was associated with a wholesale drug firm in Louisville, Kentucky as far back as the 1843-44 city directory. Despite a succession of differing business partners he continued in the wholesale drug business until 1869, when his name is dropped as one of the principals of the Louisville Chemical Works. The Louisville Chemical Works is first listed in a 1867-68 city directory and the firm continues being listed through 1871 after which it is never mentioned. Interestingly, two other medicine firms, who used private die stamps, were located almost across Main Street in Louisville, Edward Wilder (RS265-69) and Dr. John Bull (RS42-3). 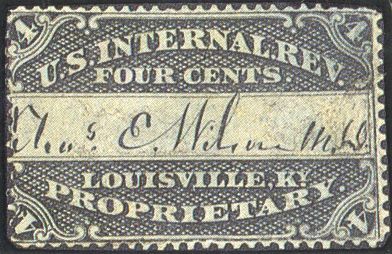 The one and four cent Bull private die proprietary stamps were approved January 31, 1866 and the first deliveries were made in April. Whether this had any influence on the neighboring firm that Wilson was associated with is unknown. But it could not have been long after. The Series advent of the Bull stamps, the Wilson initiated the request for the design of his own private die stamp, which was approved December 24, 1866. The Wilson stamp features the facsimile signature of the doctor. And therein lies one of the reasons why it is believed that only a single copy of this stamp has survived to the present. The story, first told in The Boston Revenue book (1899), is that when the stamps arrived in February, 1867, Wilson’s partner, Arthur Peter, was not pleased that he had not been consulted in the design (nor was there any reference to Peter on the stamp!). After a heated exchange, Peter is reported to have seized the stamps and tossed them into the fire. The only survivors were the ones that remained in Wilson’s hands. Regardless, of the truth of this story, the single example was found in 1875 or 1876 in a western town still on a portion of the wrapper by Wendell M. Weston, a collector and dealer in revenue stamps. As found the stamp was torn in two and skillfully rejoined. 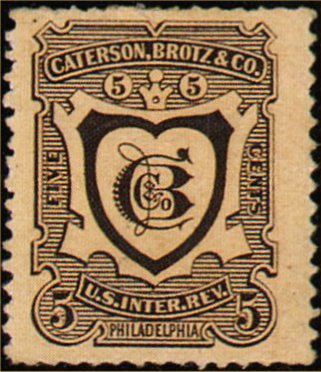 From Weston, it passed to W. C. Van Derlip, a Boston lawyer and collector, where the stamp was when the Boston Revenue Book was published in 1899. In the early twentieth century the stamp passed through the famous collections of Clarence H. Eagle and Col. E. H. R. Green. Morton Dean Joyce bought the stamp in the 1945 auction of the Col. Green collection. is even more interesting. The request for a private die came in late 1882 and an order for 25,500 of the stamps was sent by the company on December 4. The order was not fulfilled immediately and by the time that the order was ready for shipping, the tax had been revoked effective June 30, 1883. Caterson, & Co. refused to pay for the stamps, presumably because they would not have been able to use them before the end of June. So the stamps were never issued. The Boston Revenue Book reported that when it came time for the destruction of the stamps, the man who was superintending the burning saved one stamp of each kind. The young woman who verified the number of stamps to be destroyed likewise preserved one copy. Each is said to have supplied an affidavit to that effect. These copies were reported in the collections of Hiram Deats and Clarence Eagle, two of the luminaries of revenue philately at the time of the publication of the Boston book (1899). Another contemporary account in The Western Philatelist states that the person charged with the responsibility for the destruction of the stamps saved two stamps. Perhaps the truth lies in a combination of the two stories that have come down to us. In any case a total of three stamps are known today. One has had all its perforations trimmed, the copy that resided in the Morton Dean Joyce collection. Another, the second best copy, has its perforations trimmed on three sides. The third and finest copy with original gum was sold in a Harmer auction in 1990. Just three copies managed to evade destruction and they are one of the highlights of a private die proprietary collection. And the stamp was never issued in the first place! Next we turn to a mysterious set of stamps that were issued in a single year, some tobacco tax stamps that are overprinted with the words SERIES 110 and CHEWING TOBACCO in two lines. Four denominations (figures 3 and 4) of these were listed (1/2, 3/4, 14, and 15 ounces) in the 1985 Tenth Edition of Springer’s Handbook of North American Cinderellas and Taxpaid Revenues. Since then a fifth denomination, 12 ounces, has been recorded. The SERIES 110 portion of the overprint is a time limiting factor, indicating that the stamp was issued for calendar year 1940 and that the stamp was valid for that year and the following year, 1941. After that the stamps were demonetized. This is a practice that was initiated for all the manufactured tobacco categories (cigarettes, cigars, snuff, and other forms of tobacco for chewing and smoking) in 1932 with the designation SERIES 102. Thus eight years later in 1940 the designation was Series 110. The reason for the CHEWING TOBACCO overprint is not fully known, but it has been confirmed that the overprints were done by the Bureau of Engraving and Printing at the request of Internal Revenue. Further, we know that this overprint was only used for Series 110 (1940). There were changes in the tax law at this time, but there was no change in tax rate for the tobacco categories. There is no special mention of chewing tobacco in the law that would suggest why such an overprint might have been ordered. Another fellow collector has suggested to me that chewing tobacco was on the wane in American society and that Internal Revenue may have wished to get a more specific estimate of how much revenue was coming from chewing tobacco. 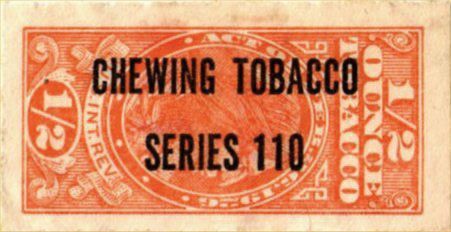 A partial estimate of the revenue from taxes on chewing tobacco was readily obtainable from the sales of tobacco wrappers which had imprinted stamps on them. Keeping track of the regular tobacco taxpaids used on chewing tobacco would have given the government the rest of the estimate of consumption of chewing tobacco. What is curious is if this was important information for calendar year 1940, why was the practice not continued? The final stamp is from an unusual category, mixed flour. This little known category of tax stamps originated in the Progressive Era as an initiative to protect the public welfare. The target of the tax was ground grain (wheat, rye, barely, etc.) on which the processor could not guarantee the origin of the contents. Thus the sack of flour might have contained mostly wheat flour, but some of it might have come from another grain. The first mixed flour stamps were issued in 1898. The early stamps had a series of coupons that were clipped to indicate the size of container that was being taxed at the rate of 4¢ per pound. Beginning in 1916, a new set of smaller stamps was issued in four denominations: 1/8, 1/4, 1/2, and 1 barrel. The three lower denominations are well known and not terribly scarce. The 1985 Tenth Edition of Springer’s Handbook ends the Series of 1916 listings with this curious note, “A 1 bbl denomination was ordered to be printed but no existing copy has been reported.” A barrel of flour contains 192 pounds, so the one barrel stamp signifies that a tax of $7.68 has been paid. In the early days of eBay a lot containing the four denominations was listed with a starting price of $5.00. To say the least my eyes were strongly attracted to that listing. In those days before Esnipe, I eagerly followed the bidding daily and, as the deadline approached, I watched by the minute as more bids came in. In the end I was successful. Since then several more copies have been recorded, but I suspect the census still remains below 5. Altogether this has been a mixed bag, or should I say, a mixed sack. Ugh! But don’t say I didn’t warn you.